Last weekend I set aside some time to review Bibletime, which has just reached its first stable release after a long period of development. 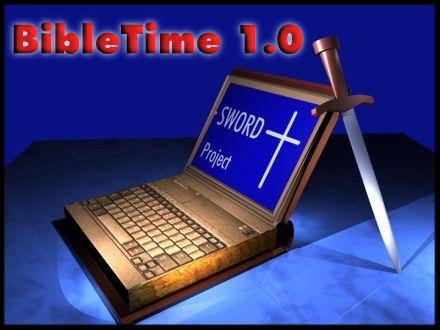 Bibletime is a Bible study program based on SWORD. 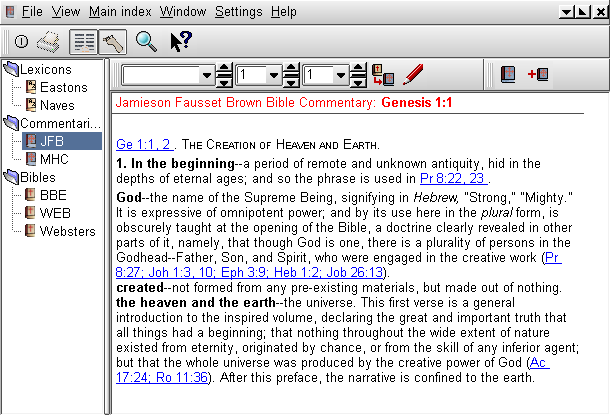 Sword is a library which provides functions for searching the Bible, bookmarking, viewing Bible text, commentary and lexicon modules and writing personal comments, but lacks a GUI (which Bibletime provides). I should note at the outset that I have never used a Bible-study program before. Nevertheless, after using the program for just a short time I appreciated what a great and useful program it is for those who read or study the Judaeo-Christian scriptures. My first attempt to use Bibletime was less than optimal. I made it a point not to read very much in terms of installation instructions and thus had improperly installed Sword, the required backend engine. This threw Bibletime into a series of errors and wrong diagnoses. Fortunately the Bibletime developers replied promptly to my questions and quite nicely explained to me how to install Sword properly. They also noted that configuring Sword and its modules was something planned for the next major release (1.1). 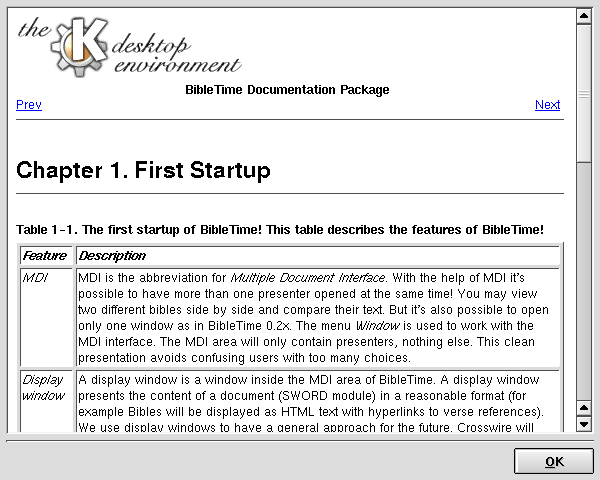 On the second time around, with a properly-configured Sword, Bibletime launched with a nice splash screen, followed by an overview of the program from the online help. 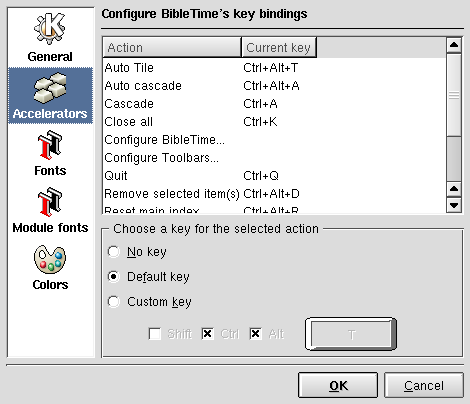 After dismissing this, a configuration dialog appeared which permitted configuring Bibletime for the first time. 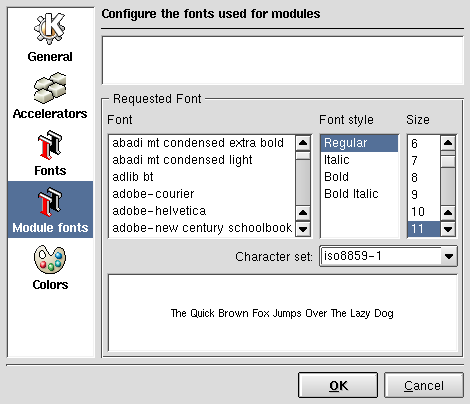 Options included General, Accelerators, Fonts, Module Fonts and Colors. 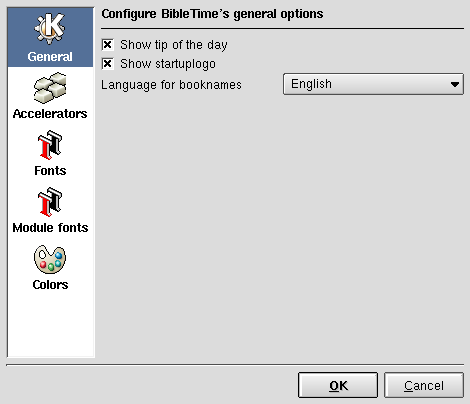 After the initial configuration, Bibletime greets you at startup with a tip of the day, which can optionally be disabled. 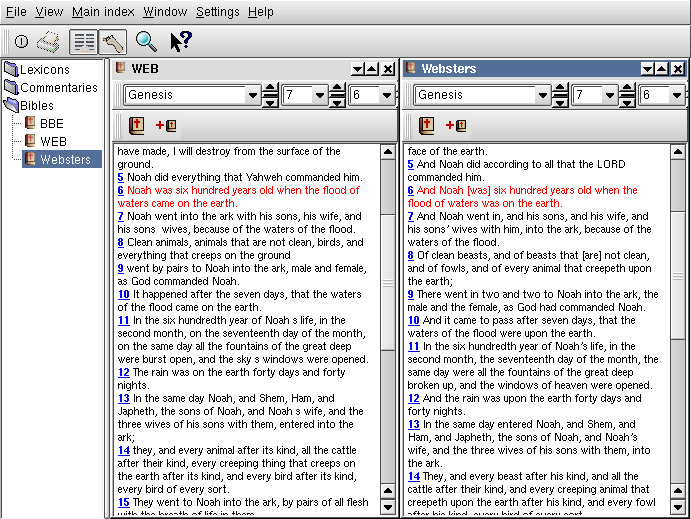 Bibletime offers a well-managed MDI interface. 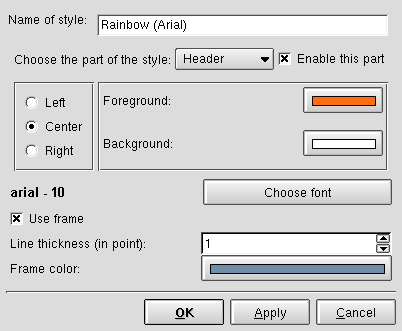 Document views can be automatically arranged (cascaded, tiled, maximized and minimized) or individually resized. These work quite well but the individual windows have a tendency to jump around and resize themselves when changing their arrangement or adding/deleting windows. As I mentioned briefly, Sword comes with several modules, such as Lexicons, Commentaries and Bibles. 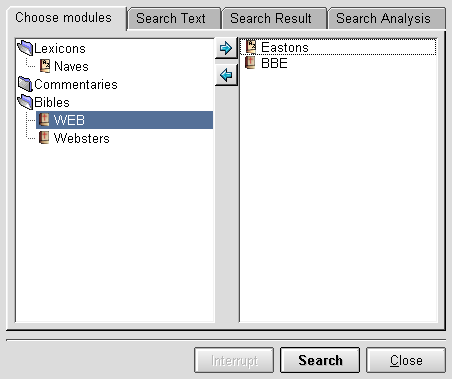 The Lexicons have an easy-to-use search box for looking up biblical references. The Commentaries use cross-linking for easy navigation to biblical references. 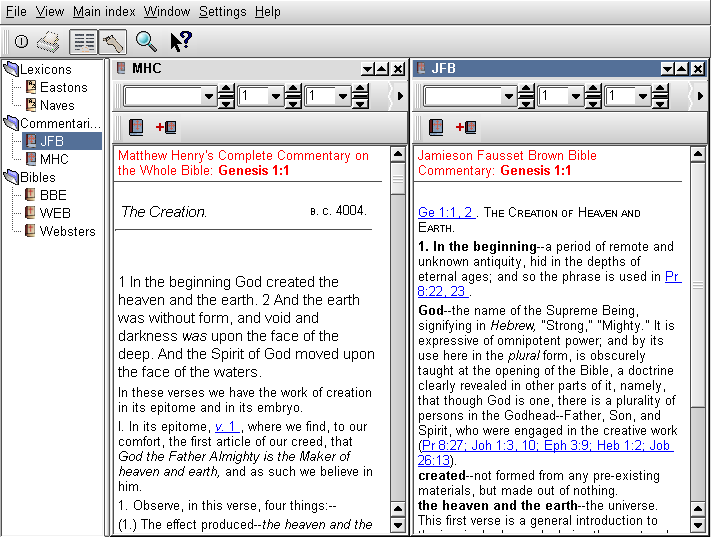 Different Bibles can be aligned next to each other for easy comparison of specific verses, with either a tied comparison or a side-by-side comparison. 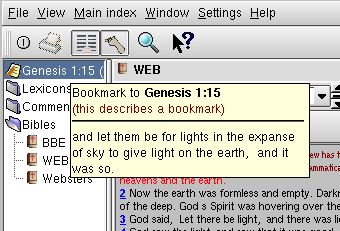 Bibletime also features an easy bookmark system. For example, you can drag a verse number from the display window into the main index to create a bookmark. Bibletime provides you an opportunity to comment on the bookmark. 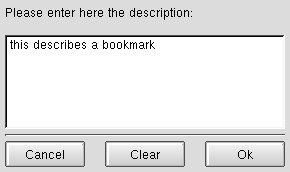 When the mouse hovers over a bookmark, the text of the verse is displayed in a tooltip. Dropping a bookmark on a display windows brings that and the surrounding verses into the display window. 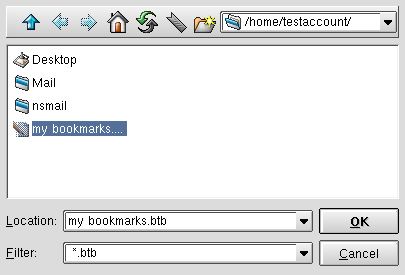 Bookmarks can be managed in (possibly nested) folders, and can be imported (from other Bibletime bookmark files) and exported. However, these options are available only in a popup menu in the main index and not in the main menu (where I stubbornly looked for it). The only browsing feature I missed in this well thought-out interface was the ability to "go back" after clicking a link (in fact because the authors chose to use a QTextBrowser and QTextEdit instead of KHTML as their HTML viewer you do not get any of the features of KHTML). 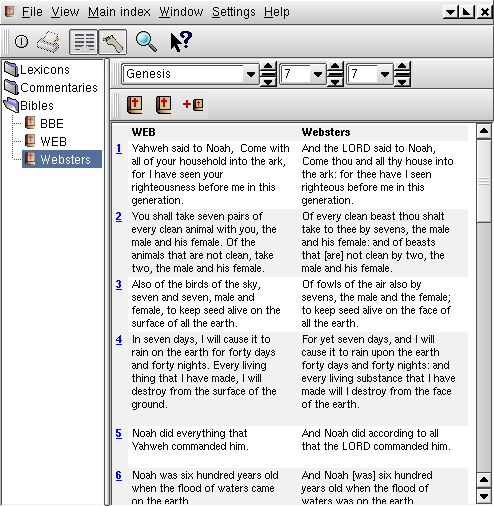 Bibletime does a superior job at helping users navigate the program. 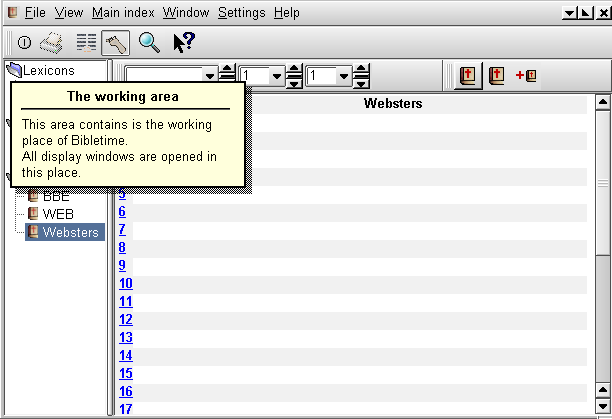 It includes a What's This help system as well as the standard KDE-formatted online help. This help includes some resources about Bible-study as well as the Bibletime Handbook. 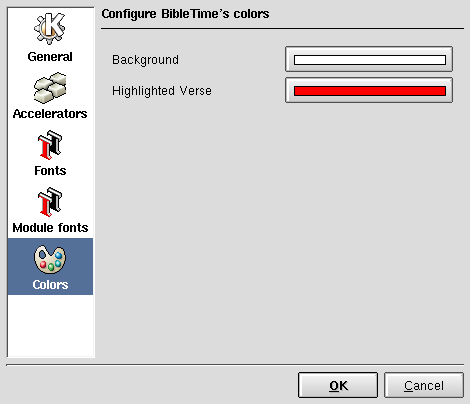 Bibletime has the framework in place for full and customized printing support. 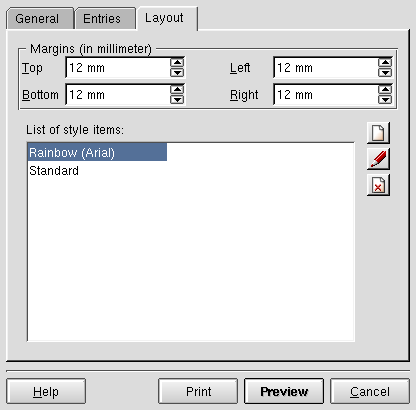 Printers and major print options can be selected and the print layout can be configured, including a print style editor which permits you to create a number of different printing styles. 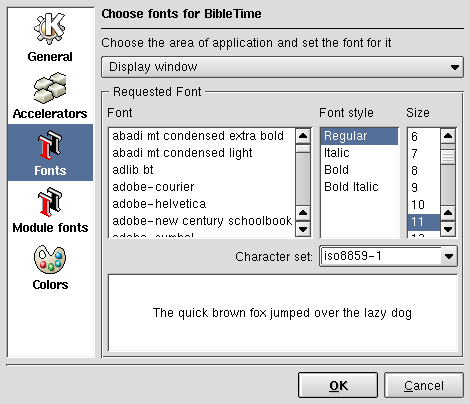 To print, you first have to select the text to print by right-clicking in a display window and sending the material to print (for example, a chapter when viewing a Bible) to Bibletime's print spooler. 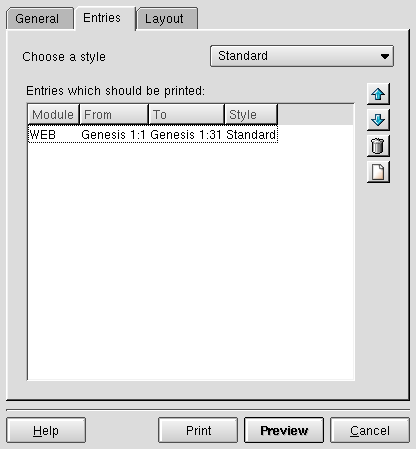 This enables the Print item in the File menu (as well as the Print toolbar icon) and places the print job into Bibletime's print spooler. 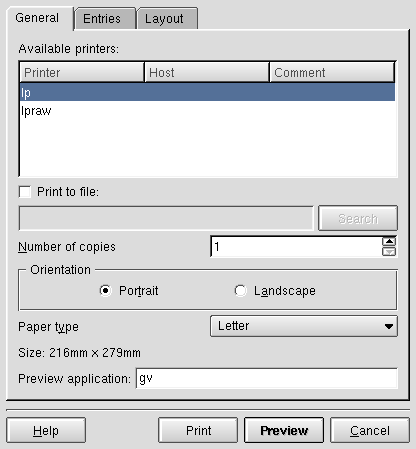 To actually get output you have to navigate to the spooler and select to print the job. Unfortunately printing did not work for me, I simply ended up with a few lines of what looked like PostScript stair-stepped across the top of the page. 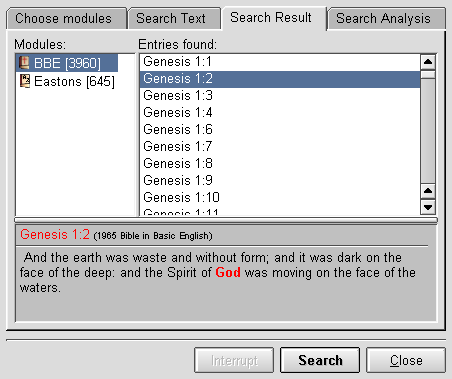 One of the neat features of Bibletime is its powerful search capabilities, though the search dialog is currently somewhat cumbersome. It contains four tabs, the first for choosing modules to search, the second for specifying the search text, the third for displaying results, and the fourth for displaying search statistics. 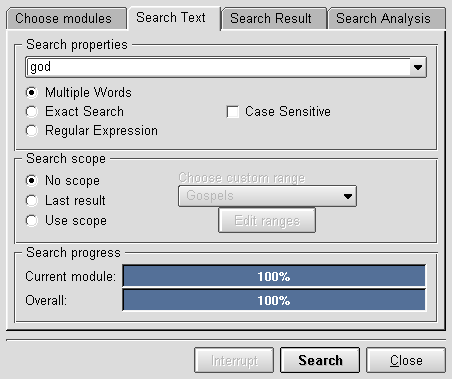 The Search Text is especially powerful, permitting phrase searches, regular expression searches and "OR" searches; it also provides progress dialogs as visual feedback. If a match is found, the Search Results tab is automatically selected; if not the Search Text tab remains active (which can be a bit confusing the first time). Search results can be dragged to the main index and bookmarked just as in the case of verses in the display window. 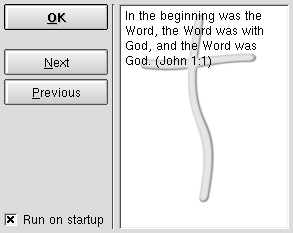 Bibletime is already a true godsend for religious KDE users. It is easily useable though it may take a bit of time to learn some quirks. I think the next release will make it even better, particularly by providing a GUI for the difficult Sword installation/configuration. Besides this, my personal wishlist item is to use KHTML for its advanced navigation features. Copyright © 2001 Andreas "Dre" Pour. All rights reserved.